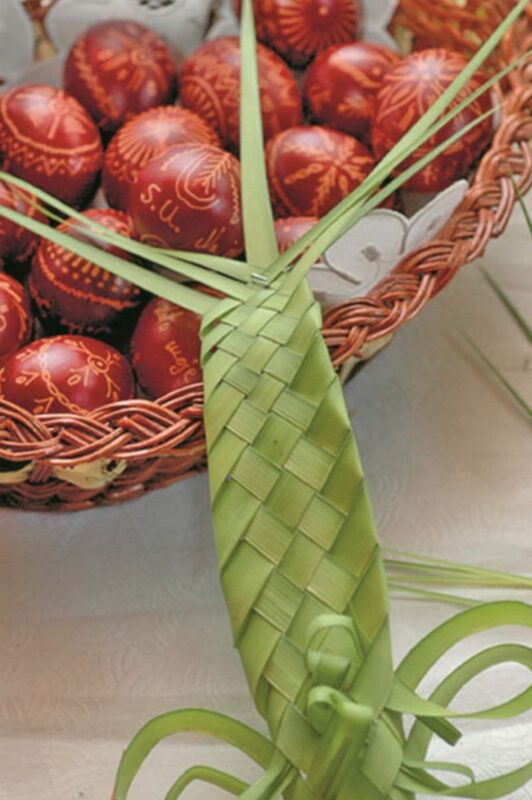 In the Holy Week before Easter, locals begin to hand paint eggs in the traditional way, using the ˝penganje˝ technique that is especially widespread in the Dubrovnik littoral region of Primorje and in the region of Konavle.These hand painted eggs, or ˝pengana˝ eggs, are characterized by the harmony and beauty of making the ornaments, written messages and greetings that are specific to this region. Although the old-fashioned ˝penganje˝ technique seems extremely complicated at first, the experienced ladies from Primorje and Konavle claim differently. As they say, the more eggs that are painted, the more beautiful they become. Raw eggs are painted using a needle with a protruding tip that is mounted onto a piece of wood, most often laurel. This tool, called a ˝penica˝, is then dipped into melted beeswax and is used to write the message. In the old days when the old farmhouse kitchens were still in widespread use, women would hold a bowl with ashes and embers in their lap, where the beeswax would dissolve at a constant high temperature. Today, the bowls with the beeswax are kept on a stove or on a special stand with a small candle that melts the wax and makes the work easier. It is said that for Easter the first painted egg is given to a dear person, so it is no surprise that many of them feature a heart as the fundamental theme.Expressions of love and affection are the purpose of ˝pengana˝ eggs, gifts that often revealed romantic crushes or hidden feelings. Therefore, in times past, one would carefully choose the recipient of such gifts. Red ˝pengana˝ eggs are especially appreciated because they symbolize life and nature.